I completed the hand stitching on my felt fossil piece that I created for the 4th Quarter Challenge. I added scattered straight stitches in colors that were already present in the “fossils”. I felt like the grey background was a bit plain and I needed to move some of the colors to other areas in the piece. Here is the piece completed. From a distance, the background just looks mottled but you can see the colors of the background stitches when you look up close. You can click on the photo to enlarge it and see the details better. Here’s a photo so that you can see the texture a little better. It does have quite a bit of surface dimension. Now I have to decide how to finish and frame the piece. How do you finish your pieces? What would you suggest? 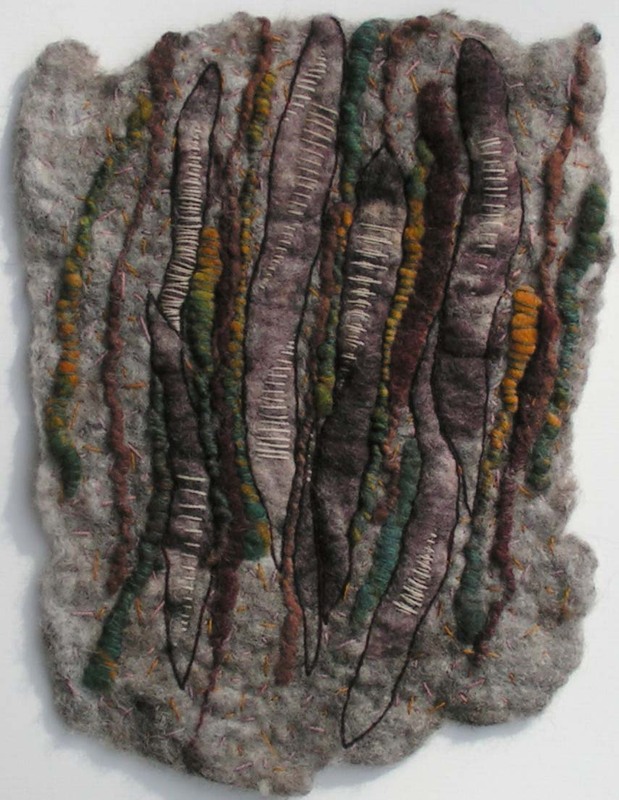 This entry was posted in Challenges and tagged hand stitching on felt, wet felting. Bookmark the permalink. 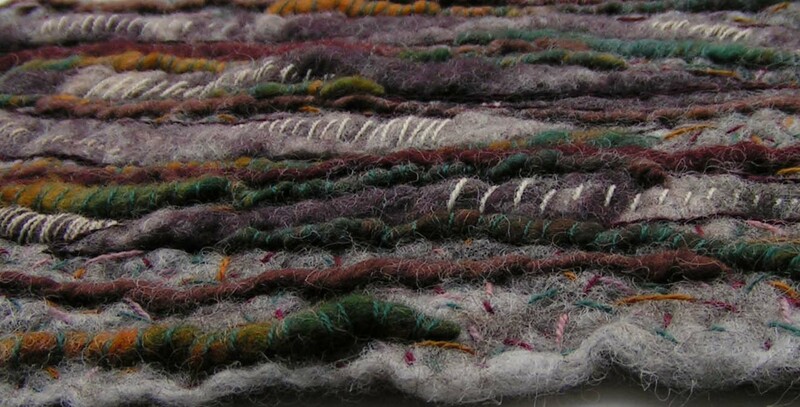 Ruth your stitches have certainly ‘spread’ the colour effectively and it has great texture. I would definitely recognise it as a ‘Ruth’ piece. The work has lots of detail up close so I’d be tempted to just frame it with matte board, but make the board significantly large so that your work becomes a smaller central focal point to invite this inspection. Thanks Antje! I will have to see what color matte board would work best. I am currently thinking about a darker grey. The result is gorgeous! Will have to try this at some point. Thank you for sharing. Thanks Lise! It was a fun project. Thanks Sunny! Burlap is a good idea and I might even still have some in the right size. It looks terrific Ruth! Sunny’s idea about burlap is good. Thanks Lyn, I will see what I already have. I think I might have some burlap left. I will have to try out various options. Or a piece of slate? The kind with jagged edges the thickness of a grey roof slate – not the blackboard stuff. That’s a great idea Lyn! I really like the idea of the slate behind it. I will have to see if I can find something like that. This is fantastic. So interesting to look at. 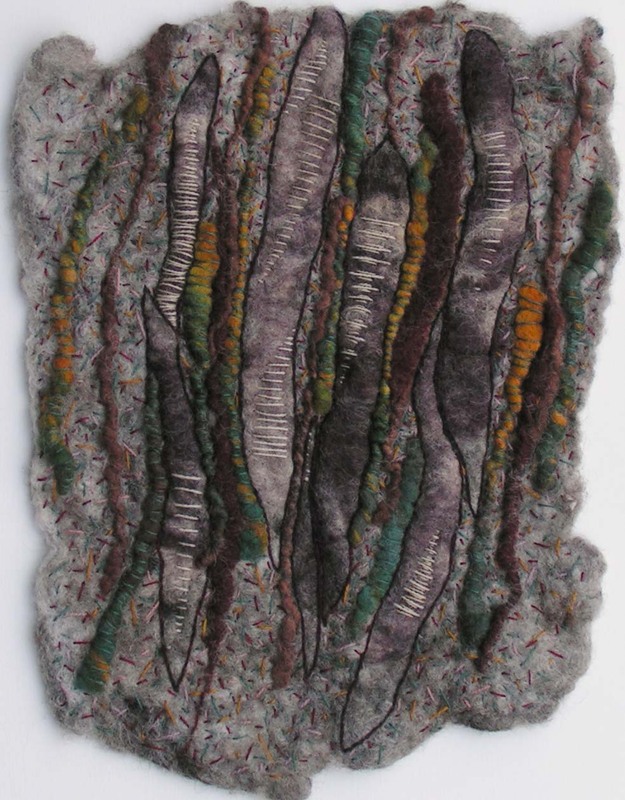 I have been playing with crocheting 2 ply wool to make fossils but like your stitching much better. I had a felt landscape framed by a professional artist. I thought leaving the glass off would be better but went his choice and it turned out amazing. I agree with Antje’s suggestion, making the frame much larger, really does enhance focus on the artwork. It’s funny you should say that about the glass, I was going to matte and frame my recent landscape series and possibly use glass but the framer (who has long experience selling art) suggested that I leave off the matte and the glass. Great piece Ruth it does look like a fossil. I hope you show us how you decide to frame it inthe end. So may good ideas to choose from. Gorgeous Ruth. I like Lyn’s idea of a slate background. I look forward to seeing it finished. Thanks Marilyn! Still working on the background. Thanks Zed! The background stitches definitely helped to spread the color around a bit.